New York, Transport - planes, trains and automobiles, Travel - bon voyage! Most frequent fliers will tell you that they can recite crew and cockpit announcements by heart: “Welcome to Airy Airways. My name is (muffle muffle) and I am your purser for flight 999 to Istanbul. Your crew today consists of Cindy and Mindy in First Class, Davis and Mavis in Business Class, and should you have the misfortune to be a sardine today, you will be cared for by Travis, Bevan, Morgan and Mercedes. 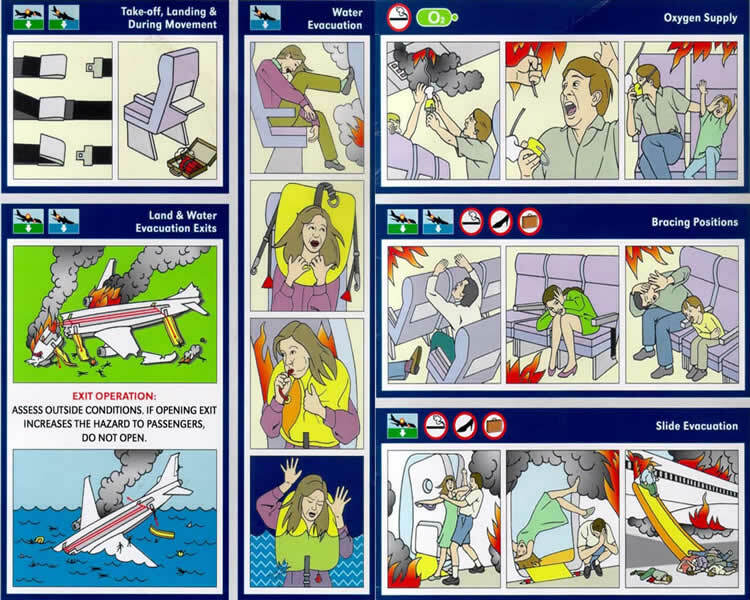 Even if you fly regularly, please pay attention to the emergency procedure demonstration that follows,” Of course, hardly any one does, except for the Nervous Flier who reads and re-reads the laminated emergency brochure all the way to the destination, by which time its corners and fingernails various are in tell-tale shreds. Then we hear various stock phrases along the lines of: “Do not inflate your life jacket until you have left the plane,” “Please turn off all electronic devices for take-off and landing,” “The flight time today will be 8 hours and 23 minutes,” if we’re lucky and, following a rumble of turbulence just as the refreshment trolley comes around, “We are now cruising at an altitude of 33,000 feet”. Recently, Monsieur and I flew to Lisbon. Let me just say that our pilot was a little different to the ordinary. Firstly, he came out of the cockpit, took the speakerphone and addressed his passengers, face to face. To say he was whacky is somewhat of an understatement. After introducing himself and the crew, he told us “I’m driving this thing tonight. We’re off to Malaga.” This was a risky joke to make. I understood that he was being funny, but others around us didn’t, “What did he say? Are we on the wrong flight? He’s joking, right?” Captain Whacky then apologised for the way an excess of hand luggage had been stowed, causing a brief delay. “If you’d like to complain, send your e-mails to Easyjet. They need a few.” he suggested. Okay, so not only was the Captain whacky, he was also unusually keen to solicit e-mail traffic for his employers. “Buy food! Buy duty free!” he then implored, “We need the money!” And, sure enough, as soon as we were bound for Lisbon or Malaga or wherever else Captain Whacky was ‘driving’ us that night, the crew certainly did a repeated hard sell on both as they trotted dutifully up and down the aisles, one (male) cabin attendant being overheard to say “I feel like such a tart.” whilst peddling his trolley of wares. Apparently, things are tough for airlines right now, as they are for most sectors of industry. Having said that, I’ll never forget Captain Whacky. He certainly spiced up the flight. Not long after Captain Whacky ‘drove’ us to Lisbon, Monsieur and I spent a pre-Christmas weekend in New York. The flight home was just as remarkable as Captain Whacky’s for far less amusing reasons. Firstly, take-off was delayed because US Immigration had decided to check the passports of all passengers on incoming flights as they disembarked, as well as in the customs hall, thus severely delaying the cleaning of the plane that would take us to London. While we were waiting, a fellow passenger approached the counter. “I’ve been vomiting,” she told the airline staff, “and I don’t know if I can travel.” They asked her various questions about symptoms and so forth, then sought out an airport doctor to come and verify whether or not Vomiting Passenger should travel. In spite of my concerns that she might infect 400 plus people with the dreaded Swine ‘Flu, Vomiting Passenger was indeed deemed fit, at least for long enough that everyone could board and the cargo could be loaded and all doors closed. But the plane sat still at the gate for longer than usual. Then the captain spoke. “Ladies and gentlemen, I apologise for the delay. We have a sick passenger on board who is not deemed fit to travel so she’s being taken off the flight. That means we have to find her bag and remove it before we can leave tonight. Once again, please accept our apologies for the delay.” Searching for the suitcase in the haystack took a while, as you can imagine. Luckily (?) for me I was sitting directly above the cargo door so could watch with ever-decreasing patience as first one, then multiple baggage containers were removed in the quest for Vomiting Passenger’s suitcase. Eventually, said luggage was located so we could finally push off, taxi onto the runway, hurtle down it and take off. Then the plane banked and banked some more. It felt as if we were going to fall out of the sky, but in fact we were fine. I never really doubted that we were fine. It’s just that, like so many people, when it comes to flying I’m a bit more nervous than I was ten years ago. Monsieur was sitting in another part of the plane so my seat-mates were a kind English couple who smiled at me every time the plane banked and my knuckles lost colour. We made chit chat, plugged into our respective movie channels, artfully pecked at the in-flight meal and rugged up for a snooze on the red eye. Sometime later I was dreaming, a rare feat on any flight, when suddenly I was woken by shrill screaming from the front of our cabin. The screaming was panicked, piercing and did not stop. Chillingly, my initial thought was “Oh well. We travel so much, it’s bound to happen sooner or later,” as I wondered whether this was a terrorist situation or the case of an unstable passenger stabbing a flight attendant because the galley had run out of Jack Daniel’s. When I think back to that waking moment, it was one of extreme resignation that Fate had taken over and there was nothing to be done but sit still and wait to see what happened. Losing it didn’t even cross my mind. In those nervous moments already frayed nerves were exacerbated by the actions of the flight attendants. They swiftly turned on all the cabin lights, which had been dimmed for the overnight flight, waking only those whose Beta blockers had left them impervious to the noisy panic, and one spoke code over the speakerphone: “Cabin Crew, Delta Foxtrot in row thirty five,”. There’s nothing like Cabin Crew Code to increase anxiety amongst passengers. “Delta Foxtrot? What do they mean, ‘Delta Foxtrot?” “Is it a bomber?” “Is someone dead?” After what seemed like an age, having seen resuscitation kits and portable defibrillator panels and latex gloves and all manner of first aid paraphernalia sent into action, we learned that a passenger had passed out cold in the aisle. The screaming woman had thought this person was dead, hence her banshee bursts of howling, and although we never found out whether or not the sick person survived the flight, things did calm down considerably and we were all able to relax (ish) in the knowledge that we were not being taken hostage. Given the Banshee Incident coupled with the Christmas Day event of a Nigerian attempting to blow up a plane bound for Detroit, I’m relieved not to be flying anywhere for a while. My feet are quite happy to be at zero thousand feet, thank you very much. Having said that, even train travel hasn’t been straightforward of late, what with extreme weather conditions and the recent Eurostar debacle where trains broke down mid-Chunnel. It seems we just can’t win. Suddenly the concept of the Staycation is an attractive one, indeed. If you’ve had any in-flight moments of madness, good or otherwise, please leave a comment below and let’s share. We can call it Post-Flight Therapy. You buy the ticket you take your chances. You either want to go somewhere or you don’t. The odds are in your favour … a lot better than Vegas. If I have to go at 33,000 feet, I always go in some piss splattered toilet. I can live with that. PR – I agree. I think that’s why I felt so calm when that woman started screaming. You make your choices, and once you’re on that plane you’re on and it’s a looooooong way dowwwwwwwn. As for the state of mile-high loos, well my Dad was travelling with us many years ago. We were on a trans-USA flight on an L1011 and he went to the loo. We hit some turbulence, the door flew open, and there he was sat for all to see. He was very embarrassed, poor man. So much so that we all STILL talk about it. On my last flight (to Taiwan — great country! ), Delta at MSP delayed the flight by 6 hours before finally cancelling it. We sat on the plane the whole time and they didn’t serve food or water, and were otherwise rude. Luckily my gf and I had packed lots of food. The upside to this ordeal was getting the chance to meet a lot of cool people through a shared experience. Hi Nicolai! Thank you for your comment. Can’t believe the airline didn’t offer food or water. As for rudeness, that’s uncalled for. But I agree that in adverse situations such as the one you mention we often find that the common experience breaks the ice for us with strangers. In London, no one really talks on the tube until you get stuck in a tunnel. Then there’s a lot of chat going on! I’ve also heard good things about Taiwan. Would love to see Taipei 101 at some point. Do you have a blog? Would love to read about your experiences there. epicurienne: Sorry, no blog here. Used to, but decided I didn’t enjoy it. I like other people’s stuff though! We went up Taipei 101 and it was pretty neat. I think it’s a beautiful building with impressive design features. For example, at floors 88 & 89 there is a 660 metric ton stabilizing ball which helps during earthquakes. And as luck would have it, there was a 6.8 magnitude earthquake 200km from Taipei early in our trip. When we asked workers at the building what that was like, they said they didn’t really notice there even was an earthquake! Taipei 101 was fascinating but my trip there was people-centered. I fell in love with Taiwan…. it’s a real gem, and I’m so eager to return! On a totally unrelated note, what’s your level of French? Hi Nicolai, well now I’m well and truly intrigued re: Taiwan and will have to add it to the Epic To Visit List. I trust the earthquake didn’t detract from your enjoyment? In answer to your question, my level of French is quite advanced although better when written and a bit clumsy at times when I speak it, especially when tired. When I’m in France I find it takes me about 2 days to attune my ear and then I improve by the minute. I studied French from 12 yrs old right the way through university, then had big breaks when I barely spoke a word. With Monsieur in my life, however, that has all changed. French is with me every day in all sorts of ways, not just lingual. It’s a beautiful language and I can see why the French are so proud of it. Why do you ask? I asked because yesterday I finally admitted to myself that French shouldn’t be my #1 linguistic goal. It was a long time coming. Been thinking about it more intensely after Taiwan. So, it was on my mind, and I knew you speak it so was curious. Originally I wanted to gain native-level French, but now, I’d rather just learn more languages. Beyond a certain point it’s a question of diminishing returns, and now I’d rather learn Chinese. As for the earthquake, it actually added to the excitement. I’d never felt one before! We were sitting on a rooftop at night, sipping tea, looking out on beautiful Taipei when the shaking began. No one was hurt (in fact no one died in the entire country! ), so I just feel glad to have had the experience. Hi Nicolai – ah. Interesting. French takes a long time to perfect. I still have a long way to go and I think I’m at that stage now where only living there will help. Italian is really straightforward if you want to build on what you’ve learned in French but with easier sounds and rules. It’s a beautiful language for a beautiful culture and I really think it would be a lot quicker to perfect than French.